Today I had the luxury of having the kitchen all to myself for a few hours; a rarity in my busy student flat! I decided to put my new cook book, Gifts from the Kitchen, to the test. Shortbread is by far one of my favourite treats and whenever I make it, it always gets eaten very quickly! The recipe in the book uses icing sugar instead of caster sugar, a variation that I've never tried before. Having now attempted it, I can't imagine ever using anything else. The result is a biscuit that almost melts in your mouth. A note of caution though, don't mix too vigorously, like I did, or you will end up in a cloud of icing sugar! I had to add a bit more flour to the dough because it wasn't quite firm enough, however I'm not sure how much the room temperature affected this as I also had two batches of soup on the go and it was rather warm! Cream together the softened butter and icing sugar until pale and light. Add the vanilla extract and mix again. Sift the flour and salt, add to the mixture and beat until smooth. Flatten the dough, wrap in clingfilm and chill in the fridge until firm. Preheat the oven to 180C/350F/gas mark 4 and line a baking sheet with baking parchment. Dust work surface with plain flour and roll out the dough to a thickness of about 3mm. 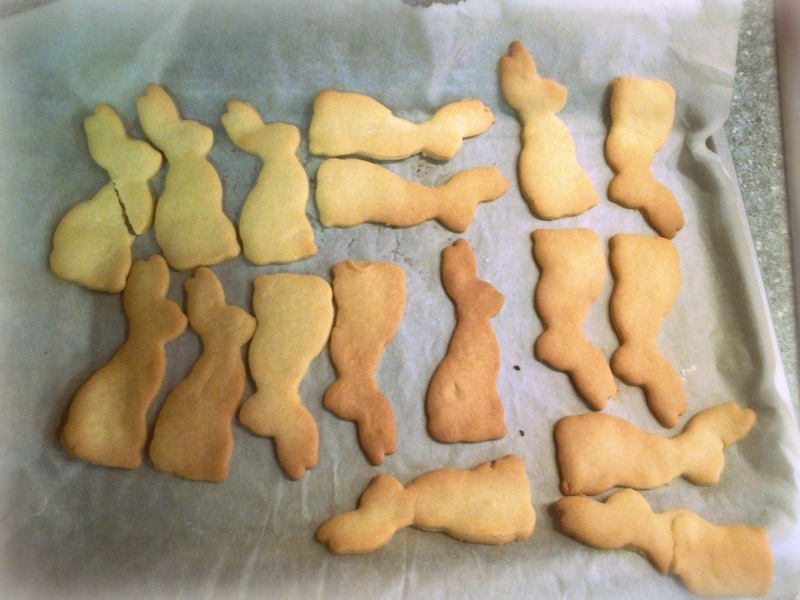 Stamp out shapes using a cookie cutter and arrange on the baking sheet. Bake on the middle shelf of the preheated oven for around 12-15 minutes, until crisp and pale golden. (Mine were in for slightly longer than this, possibly due to the thickness). Cool on baking sheets. This is a very simple recipe to follow and additional variations suggested in the book make it versitile too; chocolate shortbread is achieved by simply adding 50g of cocoa to the flour. Or you can mix things up a bit by adding stem ginger, lemon, nuts or cherries. I'm thinking about coating my bunnies' tails in melted chocolate, you could also sandwhich two biscuits together with a simple ganache. I think these are fantastic ideas and great for creating your own selection box to give as a gift and will certainly be considering it in the near future! The bunny cookie cutter was a gift from Father Christmas and is from one of my favourite illustrators, Mandy Sutcliffe of Belle and Boo. I'll be posting more about her soon, as she's just launched a new range of party ware that I can't wait to get my hands on! In the meantime, her Boo cookie cutter is available here.